Two years ago, while waiting for a bus to college, Joel Kidd had an idea. He was surprised that there was no way available to him to find out where the bus he was waiting for actually was. The computer whizz-kid soon turned his skills and knowledge towards developing a system to track his local buses. Find My Bus was born from this brainwave and the app was successfully introduced on Velvet’s fleet. Joel is now working on rolling out the bus tracking solution across the country. Chris Peat met up with him recently at his Southampton base of operations to find out more. Having the basic idea of how the app would work, Joel approached Phil Stockley, manager of Velvet, the operator of his college bus. Phil was impressed and the pair set about developing the app for the operation. What Joel did not know about the industry, Phil was able to fill him in on. The solution uses the GPS capabilities of the company’s Ticketer electronic ticketing machines (ETMs) to track the vehicles. They contacted the supplier of this device and permission was granted to integrate the app with the ETMs. It was around this time that Joel left college to focus his attention full time on developing Find My Bus. The system worked successfully when rolled out across the Velvet fleet. Despite the operation passing onto new owners, this did not spell the end for the burgeoning app developer’s career. Phil, who is now a 15% shareholder of Joel’s firm, moved onto TM Travel in Sheffield and took the app along with him to implement there. Since its introduction into this Yorkshire operation in December 2014, there are now around 1,000 iPhone users and approximately 250 Android users. On a working day, there are 50 to 100 passengers using it to track buses. The operation has a fleet size of around 70 vehicles. Tracking vehicles in real time, Find My Bus also allows users to view route maps, timetables, departures and more. Apple Maps are used for tracking on iPhones as it is native to that application and should therefore work more efficiently, whilst the Android version uses Google maps for the same reason. There is no upfront development cost, with payment through a monthly subscription. This includes automatic updating of timetable and route data as services change, as well as regular upgrades to the app itself. One feature Joel believes will prove popular is the ability to create push notifications. These allow updates and messages to be sent out to passengers’ phones, providing a direct line of communication to customers. It can detect delays and notify customers of them. Not only can users see buses on the map, but they can also see how far off schedule they are. It is not just Ticketer, the app can be used with any ticket machine or system as long as it has GPS capabilities. Joel said he is currently working on getting more ETM providers onboard with the app. One of the advantages of using the ticket machines is that no extra hardware is required, helping make it cost effective. Keeping the price down makes the system accessible to small and medium sized operations, Joel believes. This is his target market, claiming the larger operators have the resources to create their own. During my visit, Joel had already attracted some significant interest from operators, with one confirming they wanted to adopt it during our interview. Joel said that when he travels the country speaking to operators, he often hears positive responses about the app. Before releasing it, Find My Bus went through various generations to reach what Joel considers its optimum design. In the near future, the app will also integrate mobile ticketing. He already has a model for it to be rolled out, and has taken an order which will go into production in September. Find My Bus can also be configured to have a feedback bar, allowing users to leave comments and rate the tracked journey out of five stars. No personal data is collected through this process or any of the app’s functions, it is completely anonymous. Apps are not the only thing Find My Bus can do for an operator. The company also creates websites, which is something they have recently done for Eastleigh based Xelabus. Find My Bus websites take data from Traveline and automatically present it on each client’s website. This ensures the website has the most up to date information without having to manually change it each time service changes are made. The company also creates websites optimised for mobile device (phones, tablets, etc) access. This is something Joel says needs to be done in the bus and coach market, saying many smaller and medium operators have ‘huge websites that do not really fit onto a phone screen’. The websites are made in such a way that clients can edit content on them themselves when required. It has been designed to make this as easy as possible for those with even limited IT knowledge, without the need to contact a web administrator every time something on the site needs altering. ‘This saves frustrated relationships with web administrators’, according to Joel. The website offering is based off a standard version, which can be modified to the customer’s desire through a fully automated portal system where an operator can change what they want, when they want. Any custom features required can also be implemented. This type of template-based system is a common phenomenon in other industries – notably football clubs – where it works very well. However, working on his own allows him to give the personal touch to customer service. Those ringing in can be assured they get through to the right person at the right time. He showed me that whenever he gets a message through his website, he makes the effort to call them, usually within minutes – his promptness surprising many. 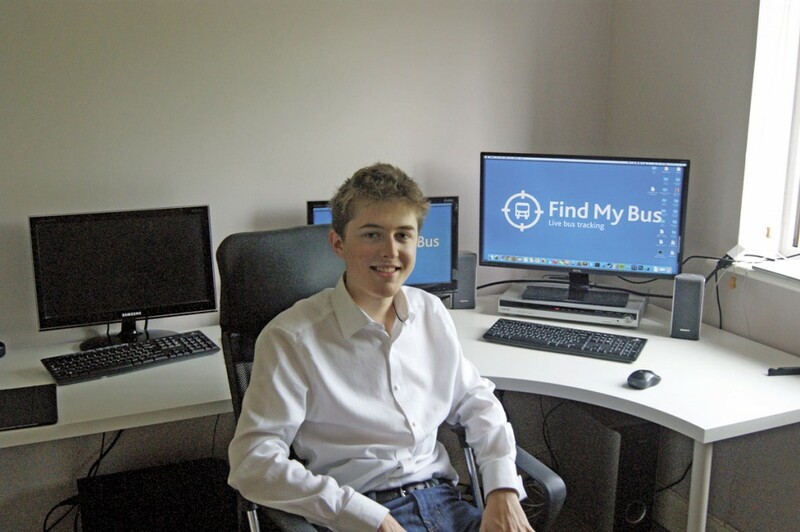 In successfully developing a bus tracking app, applying it effectively to a real life operation and now rolling it out to other companies, Joel has already achieved an impressive amount, especially as he is only 19 years old. It is likely many young men his age would not have the confidence, knowledge and strength of character to do what he has done.